A healthy pumpkin smoothie that’s velvety, slightly sweet and full of the cinnamon-spice flavors of chai tea. Easy to make, 5 ingredients, 116 calories per serving. Chai tea and I have become especially close since baby Trevor was born. Every night, he wakes at 3 am for a little snack and then goes right back to sleep. Meanwhile, I toss and turn and count sheep and can never fall back asleep. So that’s why I’m really loving this Chai Pumpkin Smoothie these days. It’s full of pure pumpkin puree, which I crave so much every autumn. It also has a velvety and filling richness, thanks to Greek yogurt. And the cinnamon and spices from the chai tea really complement the pumpkin flavor. 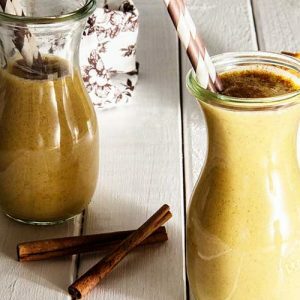 This pumpkin smoothie is really healthy too , and offers plenty of calcium, vitamin A, and fiber for just 116 calories per serving. 1.) The vanilla bean is optional, if you’re having trouble finding it. 2.) Vanilla-flavored Greek yogurt works best for this pumpkin smoothie. It adds a subtle sweetness, which helps makes this pumpkin smoothie taste delicious. 1.) Choose your favorite brand of chai tea and steep it in one cup of hot water. Then let it cool. 2.) Meanwhile, split open the vanilla bean with a sharp knife, and scrape all along the inside to scoop out all of that deliciousness (it’s a grainy, black, powder-like consistency). Toss all of the ingredients into a food processor or blender and pulse until you’ve got a smooth, creamy beverage. This pumpkin smoothie is velvety rich, with so much satisfying fall flavor of pumpkin and spice. It’s filling and nourishing, with a helpful refreshing jolt of caffeine from the tea. Pour the cup of boiling water into a mug and add the chai tea bag. Steep for five minutes, then discard tea bag. Allow chai tea to cool. Add the cooled chai to a food processor, along with all of the other ingredients. Pulse until liquid is thick, smooth, and well-blended. Pour into serving cups and enjoy. (Tastes best when served chilled).